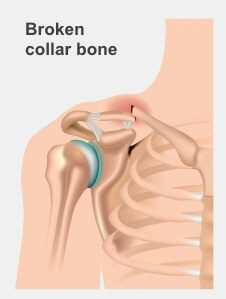 This page is about broken collar bones in adults. For children, see Broken collar bone in children. A broken collar bone (also called a fractured clavicle) is a very common injury in people of all ages. Your collar bone (clavicle) sits between your breast bone (sternum) and shoulder blade (scapula), and it connects your arm to the rest of your body. It works to allow full movement in your shoulder, and also to absorb any shock from an injury in your arm that could affect your spine. Breaks are often caused by a direct blow to your shoulder, for example if you fall on to your shoulder, fall on to an outstretched hand, or have a car accident. Although your collar bone lies above several important nerves and blood vessels these usually aren't affected when it breaks. How do I know If I have a broken collar bone? have bruising, swelling, and tenderness over your collarbone. Your doctor will carefully examine your shoulder to make sure that no nerves or blood vessels are damaged. You will have an X-ray to show exactly where the break is, and how bad it is. You may have X-rays of the entire shoulder to check for any other injuries. If other bones are broken, or it looks like a complex break you may also have a CT scan to show the breaks in better detail. How is a broken collar bone treated? How a broken collar bone is treated depends on what the break looks like. Usually, it doesn't need surgery and is treated by putting your arm in a sling. However, if the break is close to your arm or has left the two halves of your collarbone misaligned, you may need surgery. Don't do any heavy lifting, as this will only increase your pain and slow your recovery. You will probably need some time off work to let your shoulder recover. Take regular pain relief. The best pain relief is paracetamol (Panadol) or paracetamol and codeine (Panadeine). Take two tablets every four hours, but take no more than eight tablets a day. Avoid anti-inflammatories as they may slow down bone healing. At first it may be difficult to sleep with this injury. Sleeping in a recliner chair or packing pillows around you may help. keep your hand, wrist and elbow moving, to stop them becoming stiff. In the first two weeks, it's important to regularly take off the sling and move your hands, wrist, and elbow. You can do this while keeping your arm by your side and your shoulder still. 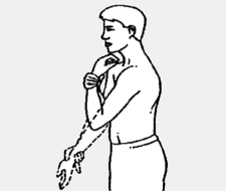 Take your hand out of the sling and slowly bend and straighten your elbow, turn your palm up to the ceiling and down to the floor. Move your wrist up and down, and clench and open your fingers regularly. See the picture on the right. After two weeks, as the pain in your collar bone starts getting better, start doing the shoulder rotation exercises, as these are the least painful. As the pain improves, add flexion and extension exercises, followed by shoulder adduction and abduction. It's important not to move too quickly or far, as this could affect how well your bone heals. It's OK to feel some mild pain, but if the exercise is very painful you are probably doing too much. If you do need surgery, it will be done by an orthopaedic (bone) surgeon. The precise surgery you have will depend on what type of break you have – your surgeon will discuss details of the surgery, risks, benefits, and recovery with you. The surgery will involve some metal (a plate, screws, or possibly wires) to align your collar bone properly and support it while it heals. Surgery usually involves one night in hospital and up to six weeks in a sling. You won't be able to drive while your arm is in a sling. You will also have a course of physiotherapy to strengthen your shoulder and get it moving again. While you are recovering you should avoid lifting or carrying anything on your injured side. You should also avoid any sport or any other activity that may make your injury worse. Your surgeon will let you know when it's safe to start doing these things again. As you recover you will have regular appointments with your surgeon, and some X-rays, to make sure your collar bone is healing well. Some people find the metal used in the surgery quite irritating, especially when carrying a backpack or using a seatbelt. If this happens to you talk to your surgeon about further surgery to take the metal out once the bone has healed. This usually won't be done until at least 12 months after surgery. Written by HealthInfo clinical advisers. Endorsed by Orthopaedic Surgeon, Canterbury DHB. Last reviewed July 2017.